Have you ever taken a moment to think about how many handmade elements are in your home? In our home we have a fair amount of creative efforts on display. I find a certain beauty and fascination attached to something handmade as opposed to mass produced things (though we definitely have a lot of that here as well!). Some of the creative elements are products of my own crafting and photography experiments, while others reflect the talents and efforts of other individuals. Some of those individuals have spent years formally studying art -and creating; others are self-taught. Can you be an artist without a degree? Where is the line between art and craft? Or is there more a line between 'fine art' and 'art', with 'craft' being yet a third category? I know this can be a touchy subject, but it's one I think about sometimes, especially since I have creative friends on both sides of the fence. In any case, I'm just happy to be able to enjoy these things in my home. I especially love knowing the person behind the creations, which is why I was happy to add another specially painted egg to our collection this year. I've talked before about the regional Easter egg market I go to each year. 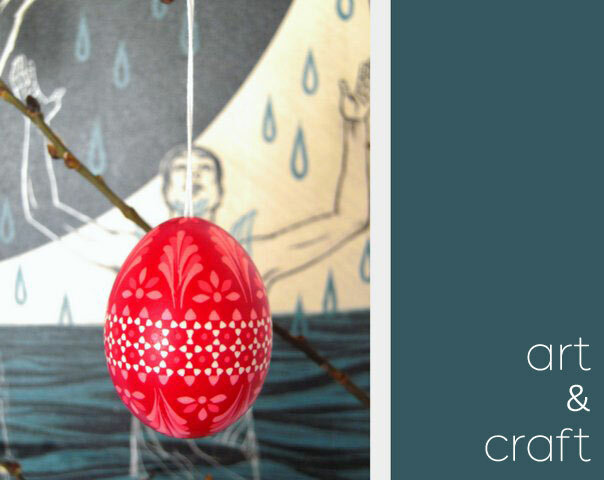 We went again this year and I was particularly taken with this red egg, painted by a woman who's creative roots reflect her Sorbian culture, common in the Spreewald region of Germany. We've had a number of short getaways to the Spreewald area, so it meant something special to talk to this woman and recognize her style. We also purchased another egg from a woman who only decorates eggs with Bible verses written in old German script. 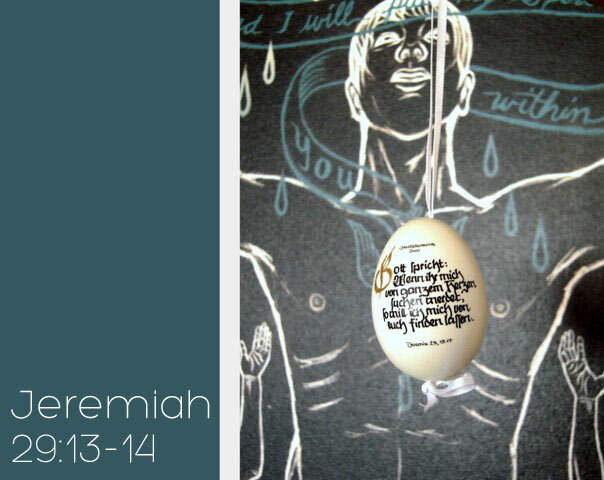 I really love these eggs because they capture so much of why we celebrate Easter: an egg to symbolize new life and a scripture reference pointing to where we find our spiritual life. We bought one with this year's Jahreslosung, but forgot to get a hanging loop put in, oops. We'll have to take it with us next year to have it fixed as I'm too scared to try it on my own! Our Easter egg tree looks a little bare this year because I just couldn't get the branches to open up soon enough. The winter weather has just dragged on too long, hasn't it? 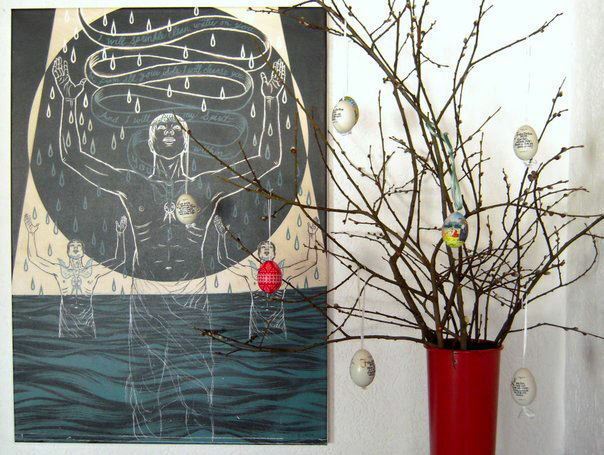 However, as I looked at the final product, I was pleased to notice how the eggs played well with the artwork behind it. It's another Chris Koelle piece we picked up while in the US this past summer (you may remember our other print of his). We liked our other piece so much that we thought a larger piece would be a nice replacement for something my husband never really liked. This cost considerably more than what it was replacing, but we were so enthusiastic about this new piece that saving up was worth it. I contacted Chris and we arranged for a custom size that was appropriate for our space. We had a bit of angst about transporting the canvas back to Germany, but it worked out and our local framer did a nice job mounting it. We even had a chance to have an all-too-brief visit with Chris and his family when we stopped by their home to pick up the piece. Between all the emails and the visit, it was really nice to be able to meet the person behind the work and see his enthusiasm and passion for his projects. You can read a little more about Chris' creative process in this interview. I should also mention what a delight it was to meet his wife, Annie, who's work I also admire (she's been featured on Decor8 and other blogs; buy her work here). What a fun stop that was; I so wish we'd had more time! That said, it makes the piece all the more special. It's another work from The History of Redemption project he was involved in. Some of the words from Ezekiel 36:25-27 are also inscribed on this piece. I really enjoy having these things in my home. I don't want to be too attached to stuff, if you know what I mean, but I definitely appreciate the ability to support creatives like this. Not only do I get to enjoy these things every day, but anybody who visits (or sees them via the blog) also gets to experience them in a way. As a bonus, I personally feel challenged to consider things when viewing art where either the meaning is obvious and/or you know the story behind it, like my friend Bryn's work. What about you? What creative expressions are in your home? How do they inspire you? Oh man, I love that piece of art and your eggs too, especially the pop of red against that art piece. I personally think that being self taught in photography has a bunch more obstacles to overcome. The recognition and respect is harder to get. But in the end, I think what's wonderful about art is that a piece hung on the wall can't tell the viewer if the author of that piece was schooled or not. The piece simply reflects the gift of the person that made it.